Approximately 1.3 billion inkjet cartridges are used around the world annually and less than 30 percent are currently being recycled. In one year, if the world’s discarded cartridges were stacked end-to-end, they would circle the earth twice. Over 300 million inkjet cartridges and 70 million laser cartridges are sold in the U.S. annually. Despite the environmental and bottom-line benefits of recycling print cartridges, every year over 300 million cartridges with a combined weight of 150 million pounds are buried in our nation's landfills. Eight ink cartridges are thrown away every second in the U.S. 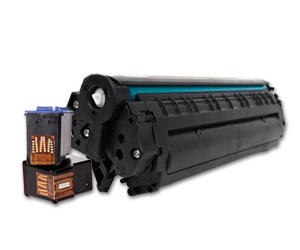 It takes about a gallon of oil to produce every new toner/laser cartridge. People can reduce landfilling when they recycle toner cartridges. Every remanufactured laser cartridge saves nearly 2 pounds of metal & plastic waste from being deposited in landfills. Toner cartridge remanufacturing saves over 38,000 tons of plastic and metal from landfills. These recycling facts have been compiled from various sources including the Environmental Protection Agency, Clover Technology’s Sustainability Report, and Earth911.org. While we make every effort to provide accurate information, we make no warranty or guarantee that the facts presented here are exact. Please also feel free to contact us at info@evolverecycling.com if you would like our sources.